Well It is Sunday night again and my 2nd week has come to an end. This week my completed projects were actually done at work. I am working on organizing the office and cleaning up some clutter. I decided to remove some old tables from a small area next to our staff table (for lack of a better term) and install a small laptop desk so it can be closer to me and the filing cabinet. Here is what I came up with.. 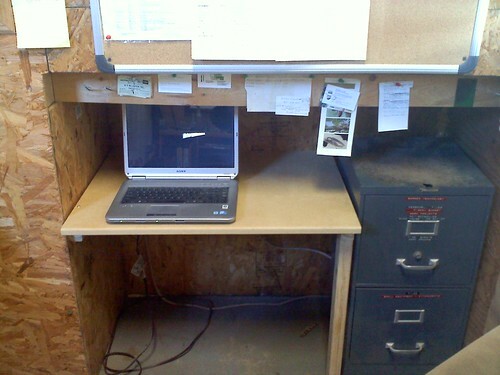 The desktop is mdf and the support system is 2×3 lumber. I of course used my Kreg jig to put most of it together. I eased the edge of the desktop with a router and a roundover bit. The second completed project was done at home for in the shop. 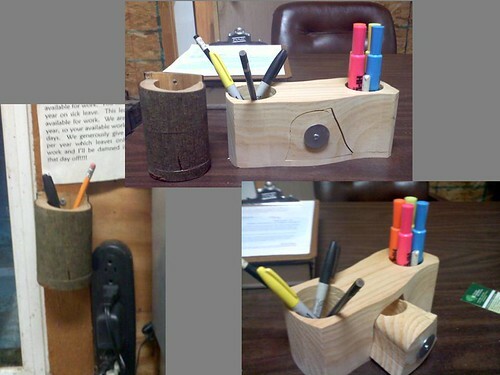 Needed a place to keep some pencils and markers near the workbench. So I used some beech I got from work a while back and went at with the bandsaw. Pretty quick and simple, but does exactly what I needed it to do. The other desk top box is one I made for myself to use at the office. I made this one a couple of weeks ago though, just never got any pictures of it. Both have semigloss coating of Deft spray. Those are the completed projects for this week so I am pretty happy with that. I then spent a large portion of today prepping for next week. My daughter is off from school and her other class (she is taking a woodworking class :) and loves it) so we are are going to spend some time in the shop building some trucks for her, her cousin and a couple of friends. I spent some time this weekend prepping wood and getting things cut out. 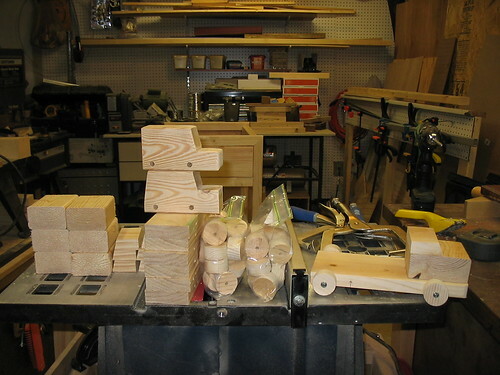 I have enough parts cut out and prepped to make 6 of the large trucks. I got this idea from the book “101 Quality Wooden Toys You can Make” Hugh Ryan & Judith Ryan. They explain how to use the basic truck to make several other types of vehicles. We already made one pick up as noted in week 1, looking forward to seeing what else we come up with. (highly recomend the book if you like to make simple toys with your kids or grandkids. Well that is it for week 2. Have fun in the shop everyone. See you have been busy. Nice job.